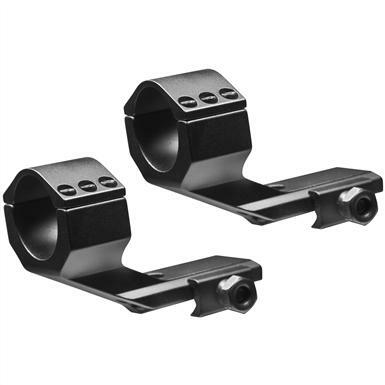 Keep your favorite optic and firearm paired with these Barska® Cantilever Rifle Scope Mounts. The Integrated 30mm Ring and 1" insert along with a forward offset design allow you to place longer riflescopes on your flat top AR. The extra room provided by these Rings will align your riflescope's eyepiece directly above the charging handle for an ideal cheek weld. 6 heavy duty screws keep the optic in place and a large thumb lock screw keeps the mount securely on firearm, even after repeated rounds. Barska Cantilever Mount with Integrated 30mm Ring and 1 Insert, Pair is rated 5.0 out of 5 by 4. Rated 5 out of 5 by shooter7 from allows clearance 56mm objective used these to mount a leatherwood dominator 6-30x56 to a gen II ruger precision rifle (.308). allows plenty of room for the optic to mount (and enough for flip caps to be added also). Great quality part, solid, well made, and so far all 6 screws holding optic in place well and on zero (with the help of a dab of medium Loctite on each screw). Highly recommend. Rated 5 out of 5 by BKYDSHTR from RINGS ARE SOLID AND FIT WELL.FIRED SEVERAL HUNDRED ROUNDS AND SCOPE NEVER MOVED. GREAT PRODUCT AT A GOOD PRICE. THEY ARE A LITTLE TALLER THAN WOULD LIKE BUT NEEDED THE OFFSET.